Ozzy Blackbeard: What a week!! It's been absolutely freezing here all week. I can honestly say I've never experienced weather like it. We had 5 inches of snow last Thursday, and it's still here. The temperature hasn't been above freezing all week. 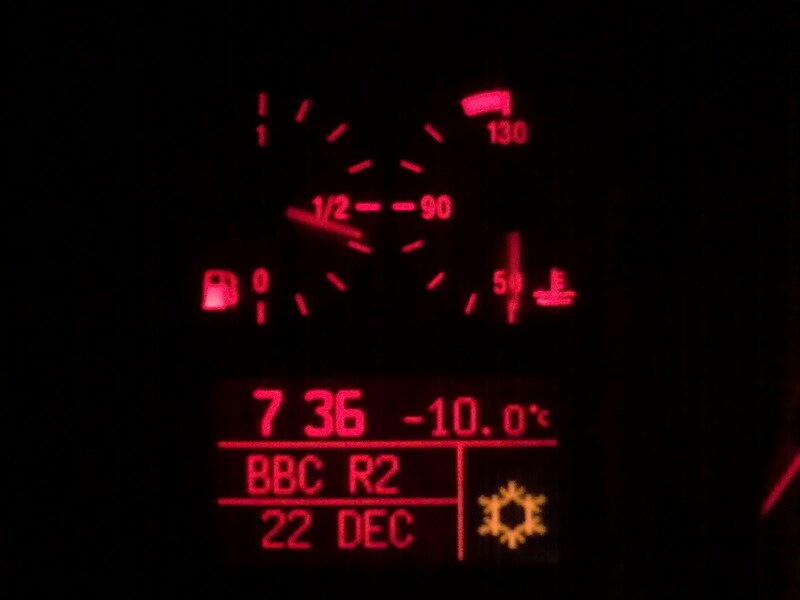 Apparently it was -18.7 degrees in Castlederg, Co Tyrone last night. -10, People!!! Brrrr..... I did have a great view of the eclipse though as I was thawing out the car! It been so cold, there's been frost on the INSIDE of my car windscreen, and the heater in my car is useless. Mr BB said it was about as much use as a mouse's breath - he's right! I now have a big piece of cardboard propped up on the inside of the windscreen, and two towels on the outside. It looks ridiculous, the neighbours probably think I'm mad, but it works to stop the frost. I'll tell you what has been the best thing ever though - my Peaks Island Hood scarf. Just the thing for keeping my head, ears and neck toasty warm while scraping ice and shovelling snow. The worst thing though is the washing machine. It's in the garage (along with Mr BB's motorbike - which is why my car isn't), and the pipes have frozen. This happened last year too. The only surprise is that it didn't freeze until Monday. Mr BB's Mum has done some washing for me, but I don't like to bombard her with it, even though I know she won't mind. My Mum and Dad are in the same boat, they were relying on my sister to do washing, but now my sister's cold water pipes are frozen. It's all very trying. But according to the BBC Weather web site, we should have +5 degrees on Boxing Day, so hopefully everything will thaw out without any burst pipes. Thankfully the heating is still working, as it's been on the local news that frozen pipes have effected lots of folks central heating. , and I used lots of yarn from my Granny's stash. The blue is Wendy Merino DK, and the beige is Wendy Ascot DK. It was all done on 6mm needles. The yarn is machine washable, so I'll wash and block it whenever the washing machine feels like working again. I have about a gazillon ends to sew in now. I noticed on Ysolda's website that her new book, Little Red In The City, is now available to pre-order. Whilst I'm not fussed on paying for something that I won't have until March, after the week I've had, I've ordered it. I have to say I'm stupidly excited about a vest in it called Angustora. I saw it ages ago on Ysolda's blog and loved it. There are also some lovely cardigans too. When you pre-order you get a Ravelry download with information about each pattern. Tomorrow I will, as usual, be going to Mr BB's Mum and Dad's for my dinner. I can't cook; and when it comes to Christmas dinner I have no shame, and will go to where I will get the loveliest food. I got a sneek peek of the dessert (pavlova), and also the stuffing (top best bit along with the roast potatoes) when I was getting some washing done this morning. I can't wait! I hope everybody has a lovely Christmas, and Santa is good to you all! Happy Christmas to you and Mr BB! Keep warm!